We’re a big fan of Scott Brinker’s?MarTech conference?and always love checking out other company’s technology stacks in the annual “Stackie Awards”. So we were super thrilled to be announced a winner last night at the MarTech SFO event, and hear Allocadia named a Stackie award winner! ?See all winners, stacks, and more.? We have a unique perspective into what goes into an award-winning tech stack. Not only did we take home the award this year, but our client?Microsoft also won a 2017 Stackie. While Allocadia and Microsoft are on two different ends of the spectrum in terms of company size, there are noticeable similarities in how they approach their marketing tech stack. 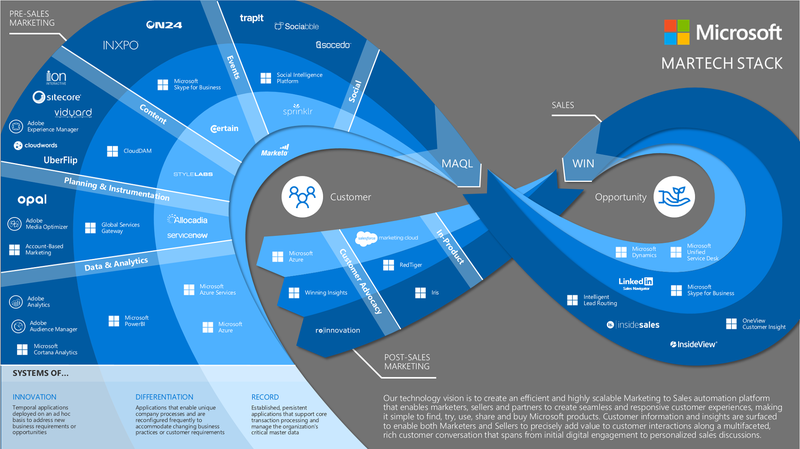 Microsoft’s has a similar infinity loop of sorts, they “kick off” with measurements and planning and they intertwine sales, product, and customer advocacy technologies within their stack. Marketing is a continuous practice. Look at the “infinity loop” shape that embodies both stacks above. Even while planning season is in full effect, marketing is always happening and constantly ongoing. Because of that, a continuous loop that feeds into each other is necessary. Failing to plan is planning to fail. Strategic planning is a critical part of our marketing technology stack, not relegated to PowerPoint or disconnected files. We consider planning to be part of our continuous strategy, as it’s important to look beyond “planning for the quarter” but re-planning and adjusting as the quarter and year goes on. In our recent empirical study on Marketing Performance Management, we found that companies using technologies not built for marketing planning, 80% report flat to negative revenue growth. It’s important to separate the two core functions of marketing, Run and Do, otherwise known as strategy and execution or Marketing Performance Management and Marketing Activities. Run Marketing includes planning, investing, and measuring results. Do Marketing includes attracting, acquiring, and retaining customers. You’ll see in the diagram below, as well as our?full tech stack, while both worlds are separate, they are intertwined in a continuous loop. Allocadia is at the core of how we (and Microsoft) #RunMarketing, supporting planning to investments to measurements. We believe having the right tools, processes and conversations on the strategic side of marketing is imperative to success. However, like most marketing organizations, we’ve got to pay the bills! The execution, or ‘Do’ side of marketing is what brings demand in the door, while the ‘Run’ side helps us be more precise and impactful when we consider where to spend our next marketing dollar, and where we focus our team’s activities. It’s important that we intertwine MORE than just marketing into our stack. While it’s starting to feel a bit cliché, the customer’s journey does not end with marketing and cannot be a disjointed, inconsistent experience. We mitigate this issue with a variety of sales technologies (SFDC, RainKing, RingLead, and Salesloft to name a few), and Customer Success technologies (Gainsight and Pendo) included in our MarTech stack. Many marketers forget their stakeholders in Finance! This function ultimately funds Marketing and when it comes to investments and ROI, Finance must have FULL confidence in what marketing is reporting and acting. In fact, our research also found that while only 14% of Marketing organizations see Finance as a strategic trusted partner, companies that expect strong revenue growth are 3X as likely to align these two departments. This is why making sure our financial systems are connected to the “Run” side of our tech stack is not only something we see as a best practice with customers, but something we practice ourselves. 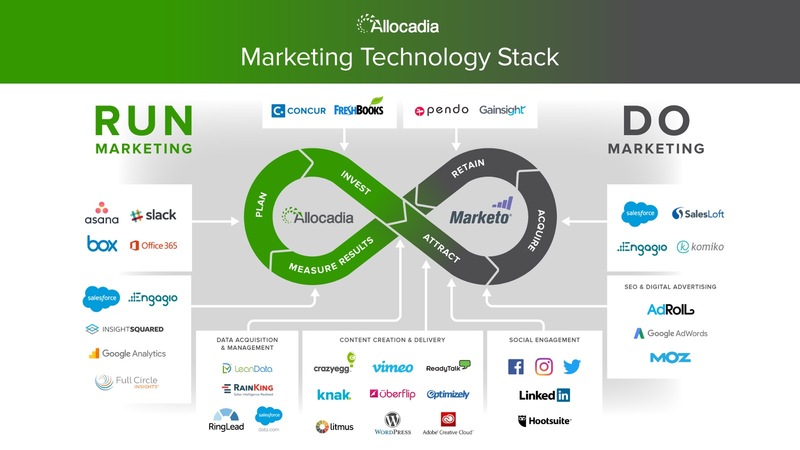 Thank you to our entire marketing team at Allocadia for your steadfast belief in the power of Marketing Technology, to our customers at Microsoft for continuing to push the envelope of what’s possible, and to Scott Brinker and the entire MarTech team for highlighting good work in this fast-moving industry. Congrats to all the winners and all 57 entrants of this year’s Stackies.